Must Hinduism change to save India's environment? Diwali firecrackers, water wastage during Holi, and polluting cremation rituals all place significant stress on India's environment. As India rises, so too does its pollution. As in neighbouring China, the herculean effort of raising a billion plus people out of poverty has left India’s biosphere in dire straits. What makes the situation in India unique is the religious element to its pollution problem. While most of India’s pollution stems from the usual suspects: transport, industry and consumer waste - a not insignificant percentage is due to the subcontinent’s religious preferences. India is located in a region particularly sensitive to climate change. The weakening of the summer monsoons is having a cascade effect on water scarcity, agricultural fertility, prevailing winds and even sea levels. 2.6 billion people live along the Indian Ocean, and the waters of this region are rising faster than the global average. While the world’s oceans have risen by 22.8cm since 1880, the Arabian Sea and Bay of Bengal have risen an additional 10cm. Weaker monsoon seasons result in less heat being blown away from these regions. In turn the waters retain more heat and thus expand in volume, causing an additional rise in sea levels. Whereas India still lags behind China in terms of economic development, it has surpassed the Middle Kingdom to become the home of the world’s most polluted cities. The World Health Organization (WHO) has listed the 100 most polluted cities on the planet, thirty of which are in India. New Delhi has consistently ranked as one of the worst, and earlier this month the megapolis obliterated the world record for particulate pollution. Ultra-fine particulate matter is a key pollutant, and measuring PM2.5 (particulate matter of 2.5 microns or smaller) levels a standard indicator of air quality. Specifically, WHO guidelines advise against any PM2.5 inhalation over 25 micrograms within a 24 hour period: various countries have legislated higher maximum threshold, with India citing 60 micrograms per 24 hour period. Average air pollution in many Indian cities is often above 100, and on November 8th, pollution levels in New Delhi were so bad that they maxed out the sensors at 999, with one ultra-sensitive monitoring system at the U.S embassy registering 1010. As the air pollution index only rates PM2.5 levels up to concentrations of 500, the state of affairs in Delhi was literally indescribable. What was beyond doubt was the smog's impact on the city, with car crashes and cancelled flights due to poor visibility and. Moreover, New Delhi’s 19 million inhabitants were exposed to air so bad that, at its worst, merely breathing was equivalent to smoking 50 cigarettes a day. India now sees some 2.5 million deaths related to air pollution every year, almost half of all such deaths worldwide. Moreover, half of New Delhi’s 4.4 million children have irreversibly compromised lung capacity. While recent levels are extreme, New Delhi regularly suffers from huge spikes in pollution. The city’s location combined with weather patterns amplify the effects of inadequate environmental regulations, garbage burning, vehicular and industrial pollution and the impact of crop burning in surrounding regions. Widespread burning of crop stubble follows the rice harvest, with much of the resulting smoke settling over New Delhi. The problem is that rural farmers are reluctant to adopt more expensive land clearing methods for the benefit of wealthier urbanites. This animosity is further exasperated by the fact that rural and urban populations constitute important voting blocs for different political parties, thus hampering compromise. Efforts to curtail air pollution in India are also hampered by a lack of leadership at the highest levels of government. India’s environment, forests and climate change minister, Prakash Javadekar has proven to be an intransigent pollution sceptic. He has contested the WHO’s 2016 list of most polluted cities and dismissed research by the Indian Institute of Tropical Meteorology highlighting links between air pollution and mortality. In February, his colleague Anil Madhav also dismissed the findings of the State of Air Global report which attributed some 100,000 annual deaths to ozone pollution. While crop burning remains a major contributing factor, it is also an easy scapegoat for urbanites unwilling to make changes in their own habits. Alongside existing concerns about waste disposal and emissions, various Hindu festivals and rituals have come under criticism for contributing to India’s environmental crisis. Remaining on the topic of PM2.5, take the custom of lighting fireworks during Diwali, the Hindu Festival of Lights, for instance. An innocent enough practice, but when combined with the economies of scale which stem from India’s giant population, a pollution nightmare. During the 2016 Diwali celebrations, the mass use of firecrackers and fireworks saw PM2.5 levels reach 883 in Delhi. As a result the Supreme Court of India banned the sale of fireworks in Delhi ahead of the 2017 Diwali celebrations. While the court’s injunction did result in a reduction in PM2.5 levels, the order itself was not fully enforced, with many street vendors and community leaders continuing to sell or distribute firecrackers. Public opinion was also against the move, a fact that further undermined efforts to curtail holiday-related pollution. The move also riled conservative elements within Hindu society so saw the injunction against fireworks as an anti-Hinduism plot alternatively promoted by either liberals or Muslims. The sacred nature of many of the events detailed in this article demonstrate the difficulty with which such topics and potential reforms can be broached. There is, however, another problem facing Holi, namely the powders themselves. While originally made from seasonal herbs and flowers, many powders (in the pursuit of profit and an ever wider palette of colours) now sold on the streets are mixtures of toxic chemicals. Fortunately, efforts to make Holi more environmentally friendly would mesh with calls to return the holiday to its more traditional roots, with worshippers forgoing artificial powders in favour of natural dyes. 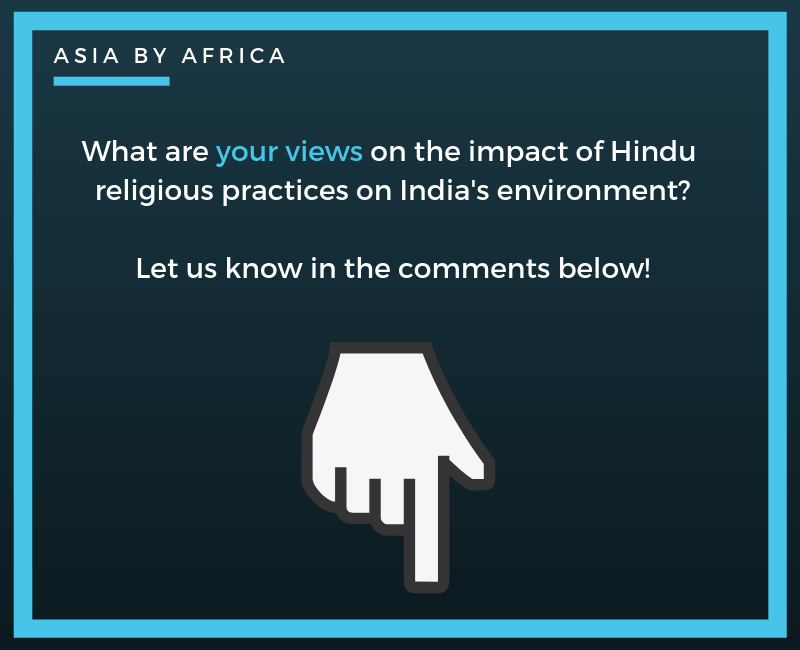 The cumulative impact of various Hindu practices does place a substantial burden on the environment. Consequently, many Indians are seeking ways to help protect the environment while not compromising the spirit of various Hindu rituals. A key example is the practice of cremation among Hindus. Cremation is seen as a vital step to free the soul from the body, and is almost always carried out next to or near rivers. The prominence of rivers in Hinduism has led many to classify the faith as a river-valley religion; one with an intrinsic connection to water and aquatic environments. Unfortunately, the preference for cremation, compounded by India’s enormous population places extreme pressures on the nation’s rivers. Pollution from the cremation process itself as well as from depositing of both cremated and uncremated remains in rivers adds to the degradation of river ecosystems. Already choked with sewage and household waste, India’s rivers are in a dire state: with the Ganges choked with filth and decay, the Yamuna ecosystem largely dead, and the Godavari, Krishna and Kaveri rivers barely (if at all) making it into the Bay of Bengal. The Ganges has become one of the most poisonous rivers in the world, yet it remains the primary source of drinking water for some 400 million Indians. A traditional Hindu funeral pyre consumes between 500 and 600 kilograms of wood. Factoring in economies of scale, this translates to the felling of 50-60 million trees each year just for funerals. This number is in addition to the far higher levels of wood consumption due the widespread use of wood and charcoal for cooking and heating. These activities in turn release many millions of tonnes of greenhouse gases into the atmosphere. Commentators such as Amrita Nandy have mused on the absurdity of authorities issuing 5000 rupee fines for burning dried leaves, while the burning of millions of trees is not even a talking point. Growing environmental awareness has; however, led various Indian entrepreneurs to create more eco-friendly cremation services. These include more concentrated cremation facilities that trap heat more efficiently, thus using around a third as much wood as traditional pyres. Even more efficient options exist in the form of electric powered cremation suites, especially when paired with renewable energy sources. Nevertheless these innovations face strong headwinds as many continue to opt for a traditional pyre, often viewing green alternatives as insufficiently traditional or lacking in ritual significance. These examples are not to say that all Hindus do not care about the environment or are unaware of the consequences, yet the problem remains a classic case of a tragedy of the commons. India’s water and air are polluted by individual acts which various actors do not consider a problem when viewed in isolation. The cumulative effect; however, remains enormous and few are willing to change their actions during highly spiritual and important moments when confronted with mass indifference on environmental issues on the whole.